“The doctor has told us that even crying can kill her. But she cries inevitably because she’s always hungry. Whenever I try to feed, she becomes breathless. 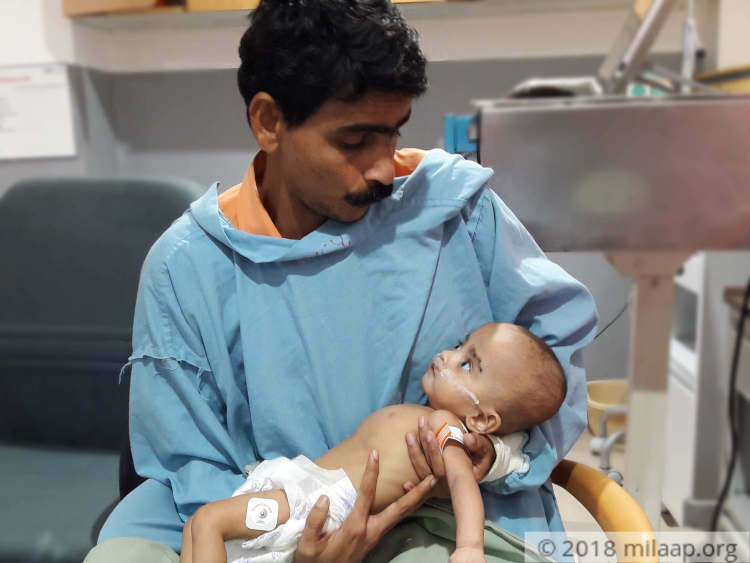 She cannot live like this for long without a surgery.”-Vijayan, father. 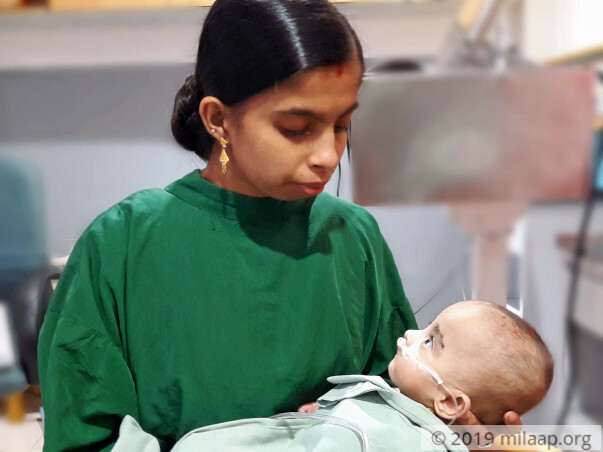 Priyanka and Vijayan’s 7-month-old baby girl has not been able to breathe normally since birth because of severe heart disease. She has run out of breath completely now – only an urgent surgery can save her life. They know that this is the only way she can survive, but these poor parents cannot afford her treatment. At birth, Priyanka’s baby looked like any other normal baby. However, she couldn’t breastfeed properly. A thorough check-up was done and it was revealed that she had a blockage in her heart, specifically the aorta. The doctors told the parents to wait for a while before getting a surgery done. However, after 3 months the baby’s condition became worse. “She never used to drink breastmilk properly at first, but I believed it was because she just didn’t have the energy to suckle. When the doctors told us it was because of her heart, we couldn’t believe it. I did not have any problems during pregnancy – nothing showed up on the scans either.”-Priyanka. 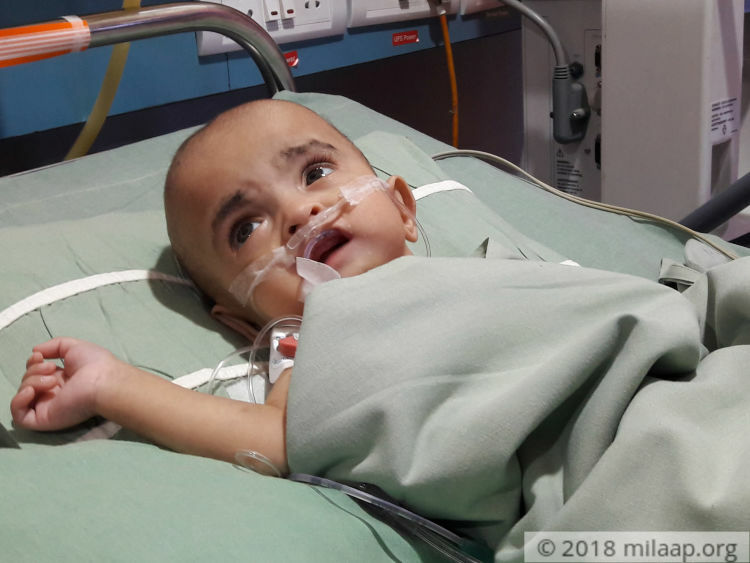 Priyanka’s baby is battling not one, but a host of heart problems that have interfered with her normal growth and development. In addition to the blockage in her arteries, she also has developmental abnormalities of valves and obstructive lesions on the left side of her heart. This is preventing proper oxygen supply to her blood, which in turn makes her breathless. “My poor baby looks more like a newborn than a healthy 7-month-old infant. When she gets cold, her breathing problems become worse. She makes a whooping sound when she is struggling to breathe. No parent can bear that sight.”-Vijayan. “She is in a very critical state now. Her surgery had to happen much earlier, but I had to keep delaying it because of my poverty. I had asked so many people, but I just couldn’t arrange the money on time and my daughter is suffering because of that.”-Vijayan. Last month, the poor baby had just got vaccinated when she developed a high fever and chest congestion. This made her choke and gasp for breath. Everything has gone downhill since then. “I am a poor shopkeeper who had to take loans to just take her to the nearest hospital in Kozhikode. We are from a small village in Kannur, Kerala where there aren’t many medical options available. The baby cannot travel long distances because of her condition, but we still took the risk of bringing her to another district because we wanted her to get the best of hospital care. Please help us.”-Vijayan. 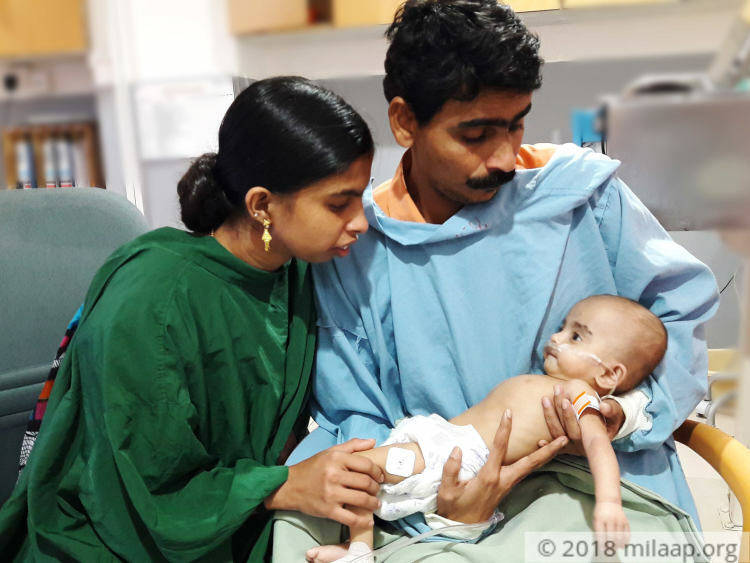 Priyanka and Vijayan’s 7-month-old baby only has a day to get a life-saving complex heart surgery. She is wailing in hunger, but she cannot even drink a mouthful of milk now. She is suffocating without enough oxygen. Her father has exhausted all the money he had saved up for her future already. “I can’t bear to see my daughter dying in front of my own eyes. She is so weak and tiny – she will not get another opportunity to be saved. 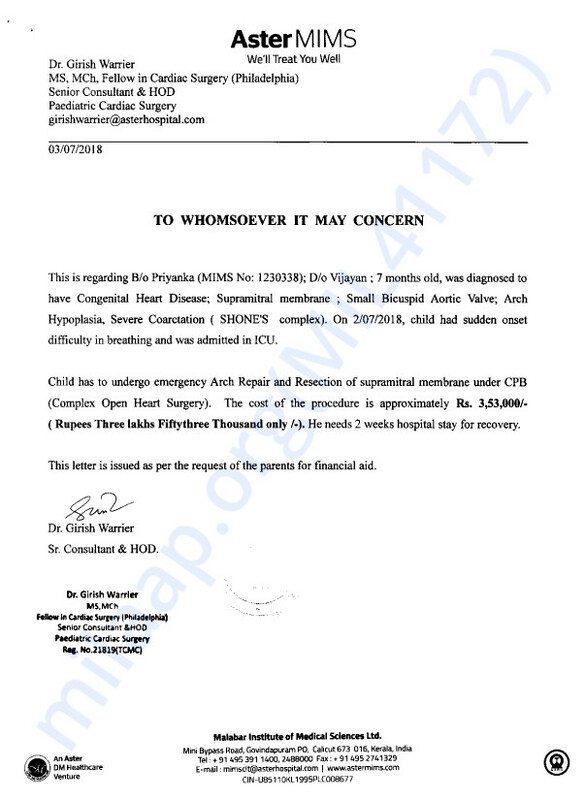 Help fund her surgery.”-Vijayan. Thank you for your lovely support. This means a lot to us. The baby was successfully discharged and is now doing well. The baby will now be on regular follow-ups so we can observe the baby's progress closely. We are all hopeful about the baby's recovery. We are very happy to inform you that the baby is doing very well and is for discharge on Saturday. The family wishes me to convey their heartfelt gratitude to all those who stood by them in their time of need. The child is starting to feed better and is not crying like before. We will be reviewing her after a month and will post update about her recovery then too. It gives me immense pleasure to tell you that Baby of Priyanka is doing well and will be out of intensive care tomorrow. 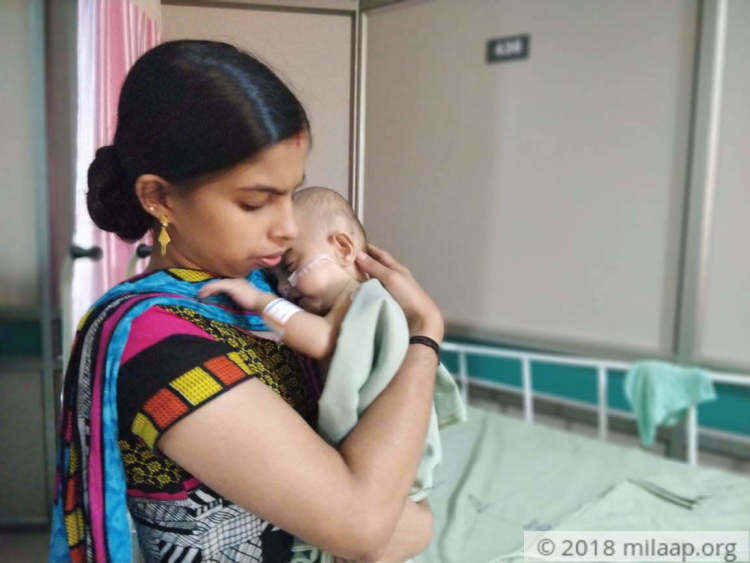 It has been a difficult journey for the baby and her family, one which would not have been possible without the help and prayers of generous thoughtful people like you. She will be in the hospital for a few more days. Sincere thanks once again to one and all. Get well as soon as possible..